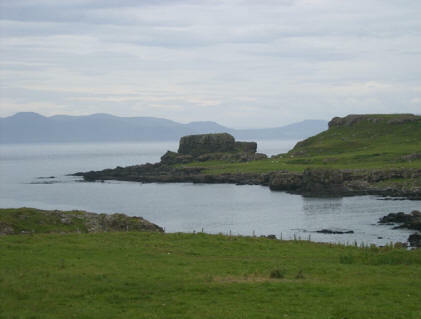 This dun is situated in a strong natural position on the top of a rocky knoll above the shore on the east side of Port na Caillich. The site is well protected because it is almost cut off from the mainland by two rocky inlets. It can be approached only via a 20 m strip of land. On the north-west, seaward side is an 11.0 m high, vertical rock face. On the south-east, landward side the summit of the knoll is approached up a 7.0 m high grassy slope, which meets the foot of a 4.0 m high rock face. The approach to the entrance is up a 0.8 m wide cleft in the lowest part of the rock face on the east side. An outwork consisting of a 6.0 m long wall runs obliquely down the grassy slope from north to south. The dun was irregular in shape, following the outline of the summit. The wall has fallen away on the north and west sides, but, elsewhere, stretches of both the inner and outer wall have survived, in some places to a height of 0.4 m. It was probably about 3.0 m thick and enclosed an area measuring bout 20 m by 10 m.